HIGH FENCE AND FREE RANGE HUNTS!! Cutter Creek Outfitters is a predominantly self guided, bow hunting, spot and stalk hunting preserve which specializes in the elusive wild boar. Rifle hunts are allowed with an extra $50 charge, but will be more controlled for safety reasons. Ask about our guide fee if help will be needed during the day!!! We offer all different sizes and varieties of hogs . 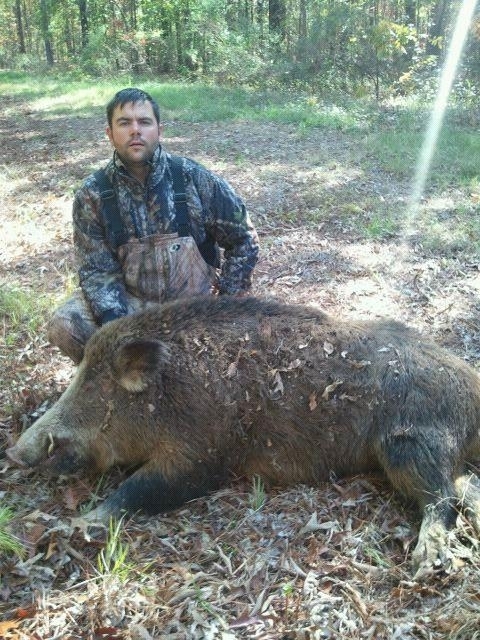 We have trophy boars for the "tusk hunter", which will be hunted in a different isolated hunting area on the property. We also have average sized hogs for the meat hunter. WITH OUR FREE RANGE HUNTS, A LOUISIANA BASIC HUNTING LICENSE IS REQUIRED! Our free range hunt consists of ladder stands over automatic feeders within bow range. These sets will be totally away from our preserve, possibly up to 5 miles from the lodge, most of which will be hunting close to a hog trap! This picture below, was in fact taken one mile north of our lodge! These free range sets would require a guide! © 2019 Cutter Creek Outfitters: Louisiana Hog Hunting Lodge & Ranch.